This is a report in progress! 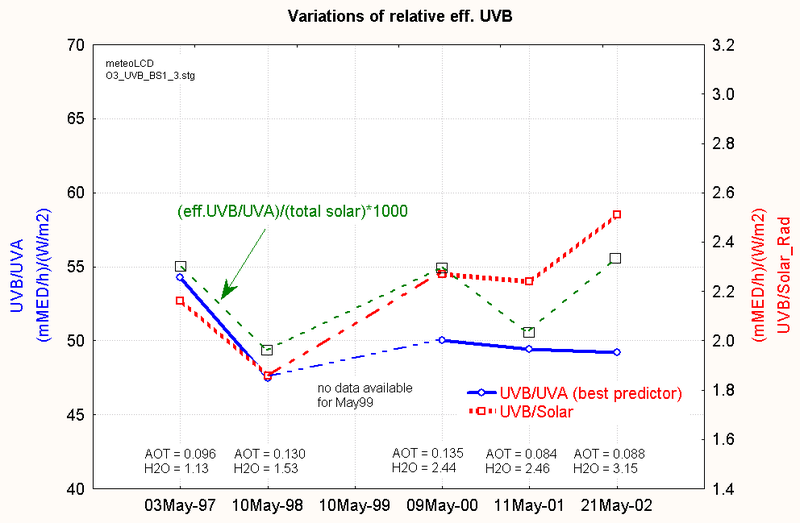 The aim of this paper is to document the inverse relation-ship between total ozone column and effective UV irradiance, and to find an eventual change in effective UV irradiance during the last years. 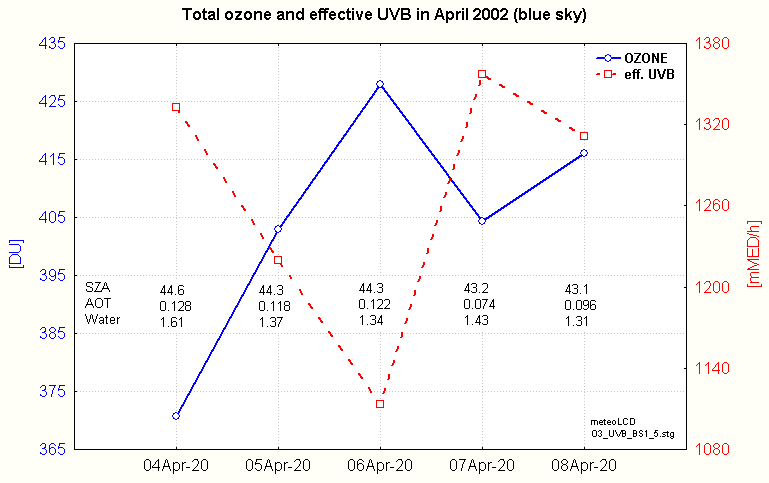 The blue sky solar and total ozone data from May 1997 to 2002 are used to check for a possible biologically effective UVB increase and for a simple relationship between UVB, O3, water column and AOT. 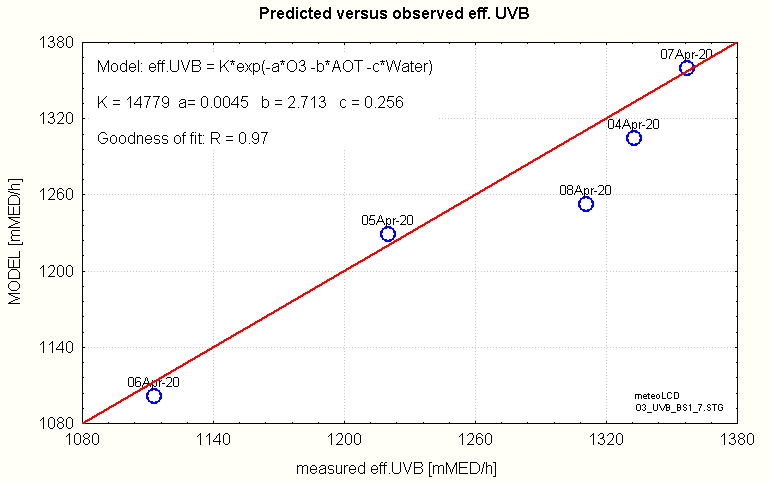 To detect an eventual increase, the quotient UVB/UVA or total solar/UVB seem to be the acceptable predictors; only data of similar solar zenith angle and aerosol optical thickness should be used. It has been found that the AOT has the greatest effect on UVB (all other conditions being the same), and the precipitable water column only a much smaller one. A simple model UVBBIO(O3,AOT,Water) is derived from these data. Click on the small graphs to get the full picture! 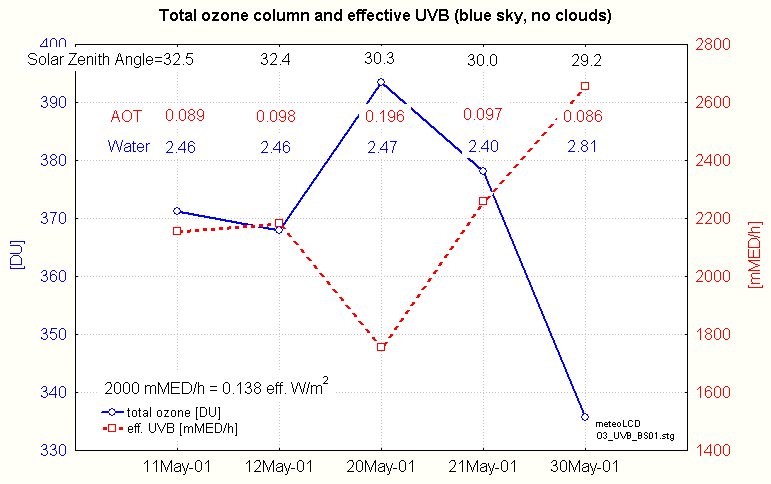 The first graph shows the five days with the corresponding UVB and total ozone column values; the solar zenith angles are given below the top border. 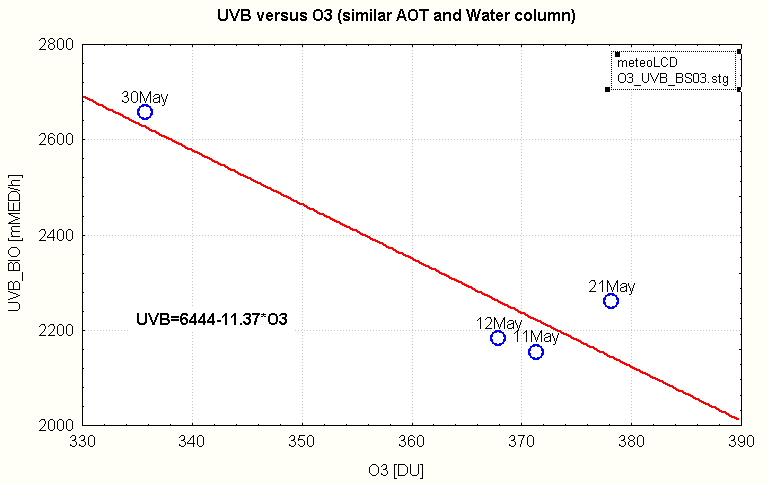 This is a beautiful illustration of the inverse relationship between UVB and O3, similar to that given in ! It should be noted nevertheless that the minimum UVB corresponds to O3 and AOT being both maximal! We do find the same situation of inverse variation as in May 2001; it should be noted that the last 2 days have markedly lower AOT than the 3 previous. Eff. UVB and O3 still anticorrelate (slope = -2.88), but the correlation is not statistically significant ( r = -0.61), probably due to the different AOT's. If we limit the analysis to the first 3 points (with AOT's between 0.118 and 0.128) we do find a significant r = -1 ! We conclude that eff. UVB always anticorrelates to total ozone in blue sky conditions; nevertheless the influence of different AOT's and, to a lesser degree, different precipitable water column should be taken into account. The best anticorrelation can be found in blue sky conditions when AOT and water column are the same. The 5 days of April 2002 allow to get an insight on the influence of AOT and watercolumn on eff. UVB. which means that and increase of 0.1 in AOT ( = a doubling of the usual mean value of 0.1) would diminish the UVB of 285 mMED/h. i.e. 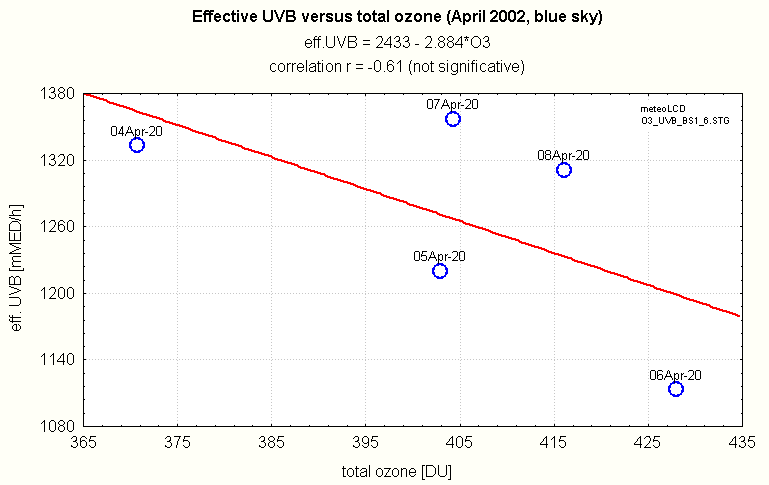 an increase of 100 DU ( = about 20-25% of the usual values) would diminish the UVB of 426mMED/h; an hypothetical doubling of the ozone column would decrease the eff. UVB by approx. 1704 mMED/h. This shows that the variations of the O3 column are the primary cause of eff. UVB variations!. We have too few data to analyze the influence ot water column, all other parameters being equal; the data give a hint that water column has a much smaller effect on eff. UVB than total ozone or AOT: indeed it should have none! The goodness of the fit is a quite acceptable R = 0.97. The model does not fit well to the May01 data, where SZA varies between 32.5 and 29.2; so it seems usefull only for practically constant SZA. 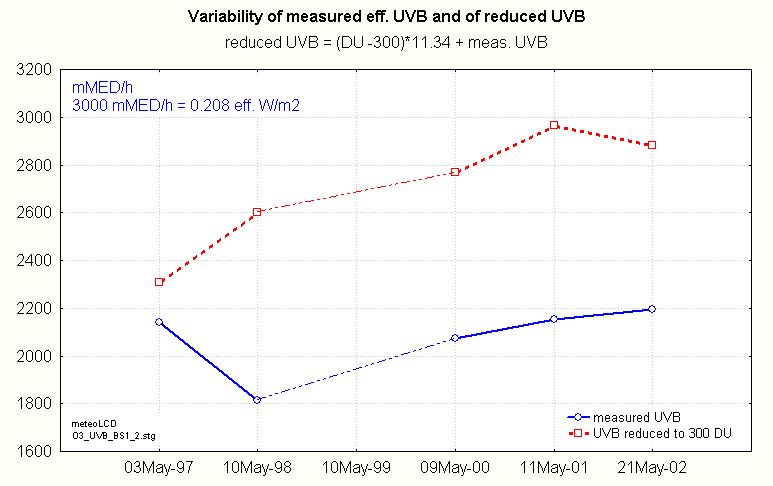 Detecting UVB changes is a difficult job: Seckmeyer  reports that, given the usual calibration uncertainty of about 5% of the best UVB sensors, detecting the increase resulting from a 1% ozone depletion will need a UV detection treshhold of 10-6 Wm-2nm-1; for our broadband sensor this amounts to approx. 1 - 2 mMED/h or, in term of voltage, to about 0.2 mV, i.e. close to the resolution limit of our datalogger. What follows should be read with this caveat in mind! The calculation of the last column was done using the slope of 11.4 found in the linear fit of the May01 data: the eff. UVB has been "reduced" to an hypothetical 300 DU ozone column by adding to the measured data the correction term (DU -300)*11.4. All 4 solar angles are so close (greatest difference about 0.014) as to be considered identical. 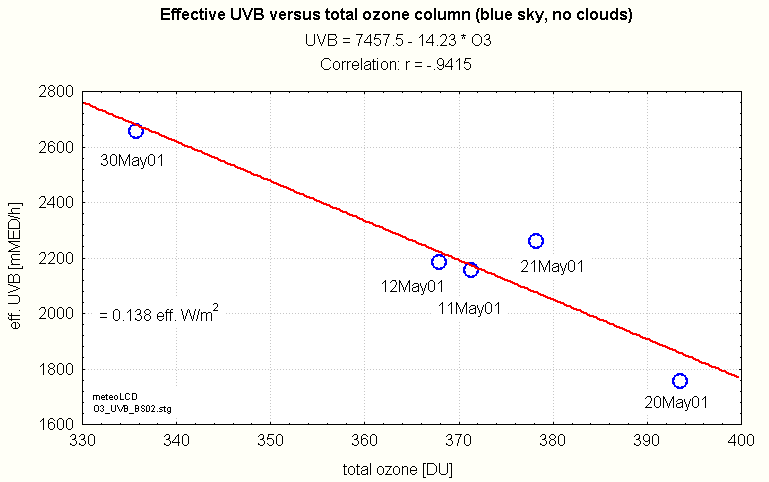 The UVB/UVA blue column shows that the measured relative UVB is more or less constant; relative UVB means here relative either to UVA (UVA is not influenced by ozone, so UVB/UVA is possibly the best predictor of non ozone caused variabilty!). 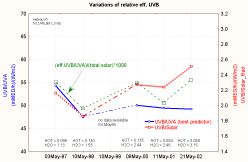 The UVB/UVA is more or less constant over the whole period 1998 to 2002, as is the fraction (UVB/UVA)/(total solar); the latter is a good indicator of non ozone caused, total solar irradiation independant variablity. Here is the plot of the eff. UVB irradiances: there is a slight positive trend (+ 38 mMED/h per year) if all years are taken into account; if one omits the "outlier" of 1998, this trend becomes +9.4 mMED/h per year, pratically negligeable. During all these years 1997 to 2002, the measured solar irradiance was practically constant (the differences in the table coming from different times of measurement!). An increase in eff. 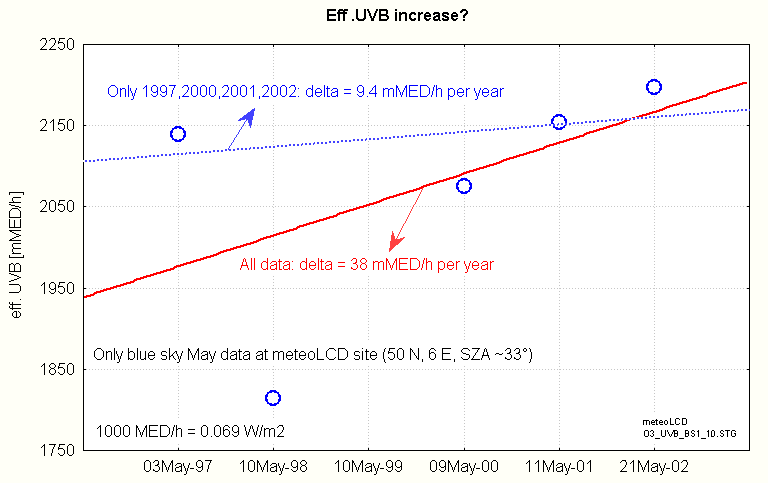 UVB in Europe since the end of the 1980's is documented in paper  (but a significant drop has been found which started at the end of the 1970s and ended in the early 1980s); our data of May blue sky conditions do not allow to conclude to a consistent increase over the 6 years span 1997 to 2002. N.Y.Chubarova, Y.I. Nezval: 30 Years Variability of UV Irradiance in Moscow. Meteorological Observatory, Geographical Department of Moscaow State University, 119899 Moscaow, Russia. 2001. V.W.J.H Kirchhoff, E. Echer: UV-Band Ozone Anticorrelations at Low and High Latitudes.